The Oriental Small-clawed Otter also known as Asian Small-clawed Otter is the smallest otter in the world. The Oriental Small-clawed Otter is found in mangrove swamps and freshwater wetlands of Bangladesh, southern India, China, Taiwan, Indochina, Peninsular Malaysia, Indonesia and the Philippines, preferring to live near water. The full grown otters measure approximately 0.9m from nose to tail tip, and can weigh up to 5kg.They feed on fish, frogs, crabs, crayfish and shellfish. 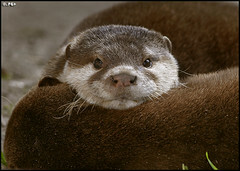 The Oriental Small-clawed Otter lives in extended family groups with only the alpha pair breeding and previous offspring helping to raise the young.